English defender Simon Ford is to complete the signing of professional terms with Kilmarnock. The nephew of former Rangers winger Mark Walters joined the Rugby Park club in October, but only as an amateur. He could not sign for another club until the opening of the transfer window as he already moved from Grimsby Town to Bristol Rovers this season. 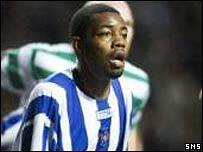 But he has made 11 appearances for Killie, who have now registered his professional contract with the SFA.